ECU’s proportional approach to the review of human and animal research is supported by four review committees. For more information about these committees, please refer to each below. Academic Board at ECU has responsibility for ensuring all human and animal research is conducted in accordance with relevant national, state and local legislation, policies and guidelines. It delegates this authority to the Executive of the Human Research Ethics Committee and for animals to the Chair of the Animal Ethics Committee. 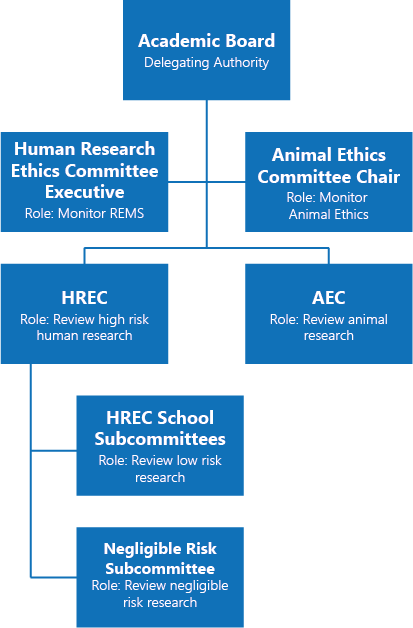 Human research review is managed by the HREC who then delegate their responsibility for low and negligible risk research to other review committees as represented in the diagram below. The University Human Research Ethics Committee (HREC) is responsible for the review of human research ethics applications which involve greater than a low risk of harm to human research participants. The HREC will review applications from students and staff whose research qualifies for this review pathway. Download the Terms of Reference for the HREC. At ECU all low risk research is reviewed by one of eight School-based Human Research Ethics Subcommittees. These Subcommittees have delegated authority from the HREC to review research which represents no more than a low risk of harm to participants. Download the Terms of Reference for the School-based Subcommittees. The eight Subcommittee’s and their membership is listed below. The Negligible Risk Review Subcommittee is comprised of the Research Ethics Team and overseen by the Chair of the Human Research Ethics Committee. This expedited review committee will typically review a negligible risk project within one to two weeks. Depending on the level of feedback requested, your project may need to be considered by reviewers for a second time. Download the Terms of Reference for the Negligible Risk Subcommittee. The Animal Ethics Committee (AEC) was established by the University Council to ensure the humane care of animals used for scientific purposes, including teaching, by staff and students, and to assist staff and students in the consideration of ethical issues involved in research. All research or teaching activities involving the use of animals for scientific purposes, requires approval from the Committee. Download the Terms of Reference for the Animal Ethics Committee.